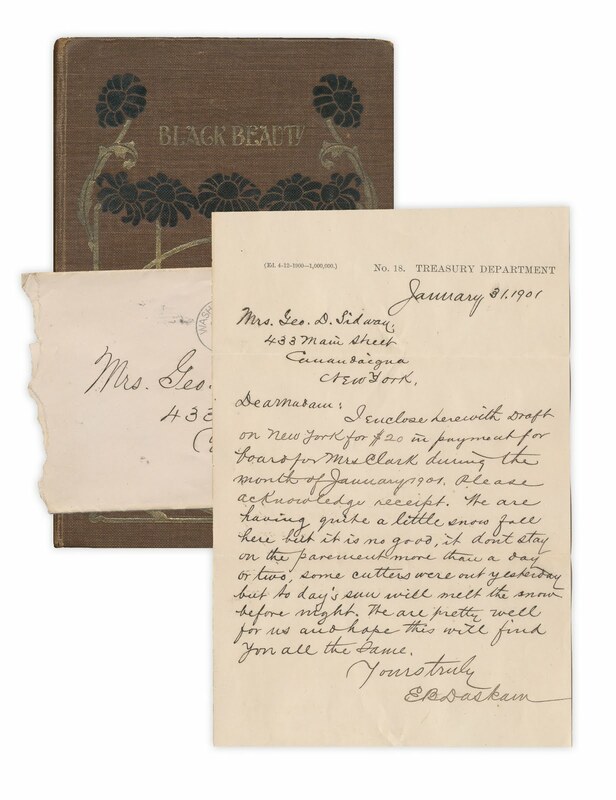 I enclose herewith draft on New York for $20 in payment for board for Mrs. Clark during the month of January 1901. Please acknowledge receipt. We are having quite a little snow fall here but it is no good, it doesn't stay on the pavement more than a day or two, some cutters were out yesterday but to day's sun will melt the snow before night. We are all pretty well for us and hope this will find you the same. Found in "Black Beauty" by Anna Sewell. Published by W.B. Conkey, no date, circa 1900. I have a copy of Black Beauty (copyright 1897, Altemus), given to my Grandfather in 1905, and in turn given to me in 1958. Beautiful illustrations, which I think was more the point of his gifting it to me. Quite the bookmark! I love this one. I too hate when the snow doesn't stick! Great find! The word "cutter" jumped out at me and sent me back to check the date. Yesterday we were at a used book store and found a photo of two boys in a book. I put it back for the next person to find! How beautiful! I love Black Beauty, and that letter is written in such a fine hand. But that aside, I wanted to let you know that you've been chosen for a blog award by me (yay!). To pick it up come on over to my blog.